Last week we decided to host some family members and serve a “burger bar”. Basically the serving plates were lined with everything you would want on a burger including bacon, caramelized onions, roasted mushroom, avocado, pickles, lettuce, tomato, raw onion, as well as an array of condiments. I also wanted to provide some homemade french fries, but then as the afternoon was catching up on me, I decided to offer up some homemade beer battered onion rings. I am typically a burger and french fry kind of guy, and rarely, if ever, do I order onion rings from a menu. However, it wasn’t long ago where I ordered the onion rings, just to change things up a bit, and wow, was I ever happy that I did order the onion rings. There was something about them that I really loved, and hence why I decided to offer my take on an onion ring, a beer battered onion ring at that. Start by taking apart your onions by popping out the rings of each slice. If they break, don’t worry. Broken rings are just as delicious. Add the rings to a bowl, and add in the buttermilk. Set aside. Next, add one cup of the flour to a bowl. Add in the salt, peppers, and garlic powder. Give that a good mix. Next add the oil to a medium sized pot and bring that to a medium, to medium-high heat. Your goal is to shoot for 350 degrees. Get another bowl ready, and toss in the remaining cup of flour. Add the cold beer, and whisk until you have a smooth batter. Once the oil is heated, strain the onions. Add the onions, about six or so at a time into the seasoned flour. Shake off any excess flour, then toss them into the beer batter. Gently add them to the hot oil, being careful not to overcrowd them as they will stick together. Cook the onions until they are golden brown, about 3-4 minutes. Remove with your kitchen spider or slotted spoon, and set them on some paper towel to remove any excess oil. Season with a bit of salt. Repeat this process until all of the onions are cooked. 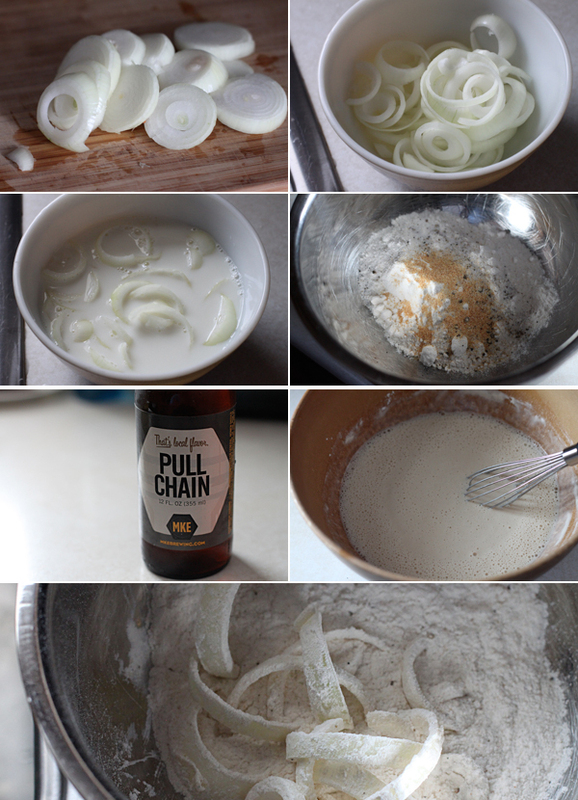 These beer battered onion rings were a huge hit. Everyone grabbed a handful, and you could just hear the crunch when they bit into them. Crispy beer batter on the exterior, and a nice and tender onion on the interior. So if you are looking to sway away from french fries during your next burger party, give these a try. Hope you enjoy. I know first hand that these were awesome! Thanks again for hosting us, Dax. I use to read you and enjoy quite a lot, but still haven´t try to make any of your recipes, because some of the ingredients are strange around here. I live in Madrid, Spain. 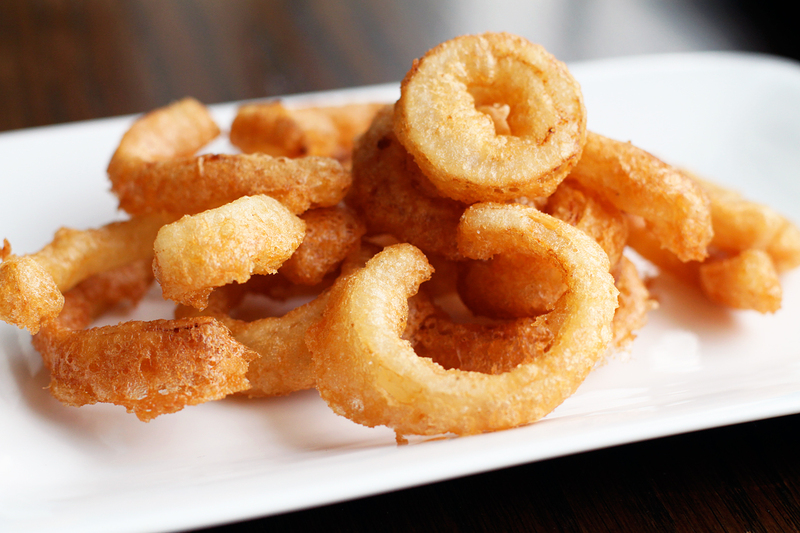 But now, I am really dying for your beer battered onion rings… in the pictures they look gorgeus! Hi Isabel, you could use regular milk as well. The buttermilk, or milk will help tenderize the onions, and impact a small amount of flavor. The process is also helpful when adding them to the flour to help the flour stick a bit better. Thanks for commenting from Madrid!